According to sources close to the situation, the departure of CEO Steve Ballmer from Microsoft last week was more sudden than was depicted by the company in its announcement that he would be retiring within the next year in a planned smooth transition. It was neither planned nor as smooth as portrayed. 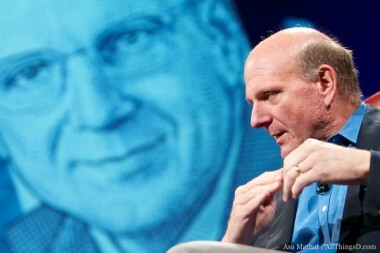 While the decision to go seems to have technically been Ballmer’s, interviews with dozens of people inside and outside the company, including many close to the situation, indicate that he had not aimed to leave this soon and especially after the recent restructuring of the company that he had intensely planned. Instead, sources said Ballmer’s timeline had been moved up drastically — first by him and then the nine-member board, including his longtime partner and Microsoft co-founder and chairman Bill Gates — after all agreed that it was best if he left sooner than later. That was due to a number of increasingly problematic issues on the immediate horizon — including a potentially nasty proxy fight, continued business performance declines and, perhaps most of all, that Ballmer’s leadership was becoming a very obvious lightning rod. That sentence spurred much chatter inside the company, including the persistent rumor that Gates had dropped the bomb on Ballmer. That sentiment was further underscored when Ballmer’s letter contained no reference or thanks to Gates, with whom he has been tightly tethered over the last several decades. Its absence has been much discussed internally at Microsoft, where it has been seen as an unusual slight and a sign of a rift. Other sources cautioned that it was not indicative of tensions between the pair, but was done to minimize “lame duck concerns” that might arise if Ballmer was portrayed as already out the door. Those sources also insist that Gates never asked Ballmer to step down sooner, although they acknowledge that he also did not — as Gates had in the past — disagree that it was best that he move on. That was still a big change, of course. Gates — who has always been and remains the key decision-maker on Microsoft’s board — had always been Ballmer’s major backer, despite increasing pressure both externally and from other directors for him to step down. Gates had rejected such suggestions for years. That included former director and Netflix CEO Reed Hastings, who many sources said had been one of the first to urge that the company replace Ballmer as CEO, as well as from a spate of Wall Street investors complaining about the company’s declining value in the Ballmer years. That’s a damning number, of course, coupled with a widespread sentiment that Ballmer had missed critical trends in tech under his tenure. Despite a strong growth in revenue, investors and others had long concluded that Microsoft had thrived when Gates was CEO and waned under Ballmer’s rule. Though early in its rollout, the changes have been jarring and created a level of chaos at the company that has led to much grumbling internally. It also did not help that the restructuring was quickly followed by a dismal Q4 performance by Microsoft. With the prospect that the next quarter could be weaker still and with numerous reports of late that there has been slowing of adoption from its new flagship Windows 8 offering, Ballmer and the board finally aligned to move his departure date sooner. Most critical to that decision, source said, were increased board worries that recent pressure from activist investor ValueAct — which has a large stake in the company — had a good chance of succeeding in its efforts to obtain a seat on the board of Microsoft, especially if Ballmer stayed in place. And even if the software giant was able to thwart that from happening, said several sources, such a public fight is untenable for the company, since it was likely to attract even more scrutiny to Ballmer’s performance and perhaps even more investor action. ValueAct has until August 30 to notify Microsoft if it plans a proxy battle, and sources said it still wants more than Ballmer’s retirement. In talks, said sources, it has asked for an aggressive stock buyback and also a dividend increase, which might assuage its efforts to garner a board seat. That said, a board seat is also on the table. Ballmer denied any pressure from ValueAct specifically in his decision in an interview with the Seattle Times, though sources said that was simply bluster. And, even with mounting pressure on him, Ballmer definitely portrayed the change as his decision in an interview he gave to ZDNet’s Mary Jo Foley last week, after his retirement announcement. “I would say for me, yeah, I’ve thought about it for a long time, but the timing became more clear to me over the course of the last few months,” he insisted. That statement also struck many inside the company as a quick shift. Ballmer, said sources, had been jumping enthusiastically into business review meetings, as part of the new structure, over the last month. In addition, he had expressed to many employees his excitement at being part of the changes he had initiated. But, in meetings after the announcement, numerous sources inside the company said Ballmer seemed uncharacteristically chastened and quiet, in contrast to his usual confident and forceful manner. Now, those inside the company are turning to what comes next. While not everyone on the board thought that Ballmer should step down without a new CEO in place, it’s moot now as Microsoft turbocharges the process — in place for several years now — to select its next leader. But, though the committee is headed up by John Thompson, CEO of Virtual Instruments and the former CEO of security software giant Symantec, most expect Gates — as usual — to be the key decision maker on that choice, too. A Microsoft spokesman declined comment.